IF, this time last year, anyone had asked what the Academy Award frontrunners for Best Picture would be, the smart money consensus would have opined that the then-unseen “Les Miserables” and “The Hobbtt: An Unexpected Journey” were clear favorites and easy bets to win. In reality, the sleeper hits, “Zero Dark Thirty” and “Life of Pi,” were the outstanding motion pictures of 2012. This year, three standouts have already emerged. “Gravity,” which opened last week and continues to rollout through mid-December, is one of them. The film exceeds the innovations in cinematography of “Children of Men” among Alfonso Cuarón films and equals “Life of Pi” in its seamless use of CGI in the 3D format. The introductions of swimming in space, floating in air and fire are majestic. See this film in the biggest IMAX screen possible, in Dolby Atmos, if possible. The first 17 to 20 minutes is one unbroken CGI shot that frames the story. The initial momentum of the film’s $55.6 million U.S. opening weekend (4-6 Oct.) has elicited a backlash about factual representations of science and space as depicted in the film, of plausibility of the physics of events. Ignore this negative campaign completely. It is nonsense, fueled by bad intentions and ill spirits. (See video at top). This is not a story about space. This is a story of adversity and the overcoming of it, of the voice in isolation and the Leap into the void. 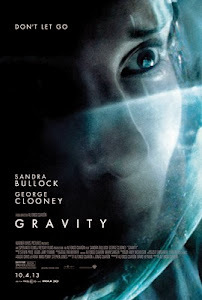 Sandra Bullock’s, Ryan tells George Clooney’s astronaut Kowalski that she could get used to the silence. But he keeps talking throughout. The voice of Ed Harris’ “The Right Stuff” astronaut serves as Mission Control in Houston in constant voiceover. Kowalski constantly reminds Ryan to keep talking even if she thinks Mission Control can’t hear. The silence of space will doom you. The sound design in “Gravity” is impeccable. The filmmakers have created a beautiful sound floor with discreet off-center touches and noises, with a beautiful sensibility of air and voice mingling with air. The voice that calms you down is often your own. The film affirms the need for calm in life-threatening and near-impossible situations. Not the voice of the obscure, but the voice of the normal everyday that, when isolated in space, is resonant and redolent of home. If the dialogue in “Gravity” seems matter of fact, it is seductive and will become clear why by the end of the film. The voice in your head will keep you grounded. The voice in your head will pull you back to earth when you are lost in space. The voice in your head will keep you alive. There remains another that restores Ryan’s hope although it is meaningless – it is not Mission Control or another astronaut – through which she is reminded of the sounds of earth almost as in song. It is a counterpoint to her statements early in “Gravity” where she tells Kowalski that she listens to anything as long as there is no talking. Her voice in the film is the voice of prayer. Astronauts Ryan (Sandra Bullock) and Kowalski (George Clooney) navigate space and other matter(s) in "Gravity." Photo from "Gravity" Facebook page. It is significant that the astronaut in “Gravity” is a woman, Not only because SB nails the performance, but also because her reactions are so subtle. Divorced from life and isolated, she is jerked back to life by the nagging responsibility to live through this, to become aware, to use her senses, to constantly leap from one crisis to another, to react though she has willed herself to be numb. The accidents of life have left her unmoored. Now the reality of being stranded forces her to remember her life, to remember her training, to come back from the brink and constantly try. To survive, to live your life, you must leap into the void and believe in yourself. This is a film about restoring one’s faith. “Gravity” is Rated PG-13 for intense perilous sequences, some disturbing images and brief strong language; visit http://www.gravitymovie.warnerbros.com/#/home to learn more about the film.